Fear is a magnet, it attracts the very object it fears. I was having my teeth cleaned one day when the topic of hiking came up. Ever since we adopted, Dixie, our very energetic dog, I have been spending more time hiking around the trails in Ringwood. My hygienist said she didn’t like hiking because she was afraid of snakes and would often see them while hiking. I didn’t think much more of our conversation, nor of the fear of snakes. Prior to having that conversation with the hygienist I had only seen a snake while hiking maybe three times in over twenty years. The very next time I went hiking after our conversation I saw a snake. Wow, what a coincidence! The next time I went hiking I saw a snake. Wow, what an incredible coincidence!! By the third time in a row since that conversation I saw a snake I realized it wasn’t a coincidence. This was something God was showing me in the spirit realm, a lesson about fear. Right then and there in the middle of the trail, while looking back at the object of my fear, the black snake, I rebuked the enemy for his strategy of fear against me. I told the fear of snakes to leave me and never to return. 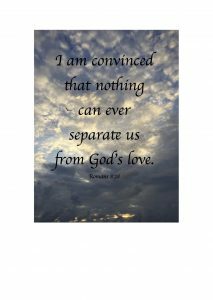 And I thanked God for His protection and reminded myself that God’s perfect love expels all fear. But I couldn’t help but be amazed at the power of fear. When I had that conversation with the hygienist I wasn’t aware of any fear coming over me. I had never feared snakes. How did her fear come upon me without me even being aware of it? I don’t understand the spirit realm or how this spirit of fear came upon me, but I believe the Lord used this as an example to teach me the power of fear. To show me the power of thoughts whether I am aware of them or not. But why the three snakes the next three times hiking? When I observe other areas in my life and in the lives of others I see this played out over and over. The fear of illness brings illness. The fear of being abandoned, or rejected brings behavior that causes one to be abandoned and rejected. Fear becomes a self-fulfilling prophecy. What you fix your eyes upon becomes your reality. The things Job feared came upon him. In much distress, Job cried out to the Lord for understanding, and God showed Job just how amazing and powerful He was. When Job saw the awesome power and sovereignty of God he was undone. He repented in dust and ashes. He thought he knew God, but he realized there was so much more about God that he hadn’t even considered. As the Holy Spirit was connecting the dots of how shame had influenced my thoughts, responses, and words, He also showed me that my belief, that I was no good, had affected me physically. I had been diagnosed with Hypothyroidism, Hashimoto’s disease, about ten years before. When I was first diagnosed I received the diagnosis, took the necessary medication, but believed that some day I would seek God’s healing. Because I believed I was no good, I attacked myself with thoughts, with actions, and with words that were destructive. They brought damage to myself, emotionally and physically. Though there was nothing wrong with my thyroid, it was in fact, good, my immune system believed my thyroid was bad, and therefore brought it under attack. I was overwhelmed with all the Lord was showing me. I remember weeping as I tried to process all I had heard Him say to me that day. The power of His love and truth were washing over me, filling me with a newness I never experienced. I was good!!! I really was good!! Not because of anything I had done, but because of what Jesus had done for me!! My cloak of shame was gone! I was clothed in Christ’s robe of righteousness! I am thankful it was so intense because there is an enemy that doesn’t want me to be free from fear and and from the prison of self. Not only that, I live in my flesh that has believed I was no good for all my life. My flesh has developed habits from that lie. Old familiar thoughts…Old familiar self-talk…Though the lie was confessed, my shame undone, the old fears are familiar and can taunt my mind. I am good, because through Jesus, God has made me good!! It’s not positive thinking, it is the truth of God! It is wielding the sword of the Spirit! When God’s word is spoken into a situation it is as a sword that fights off the lie of the enemy. At the word of God, the enemy must flee! Though I have been instantly healed from some things, Hashimoto’s disease has been a process. A process that has been teaching me how to fight fear with faith. As I have walked this journey my faith has been tested many times and each time I have been made aware of the lie, the fear, that has tested it. I am learning how to fight fear with faith and to believe for what I do not yet see. 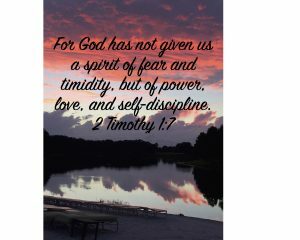 Fear of God…believe the truth…live in the spirit of power, love, and self discipline…receive the good God intends for you. Fear of Satan…believe his lies…live in the spirit of fear…receive the harm Satan means for you. Fear is a magnet, what are you attracting?